Our first autumnal dish of the season. We can suffer the colder weather when it means mushrooms, pumpkin, squash, game birds, mussels… we could go on! 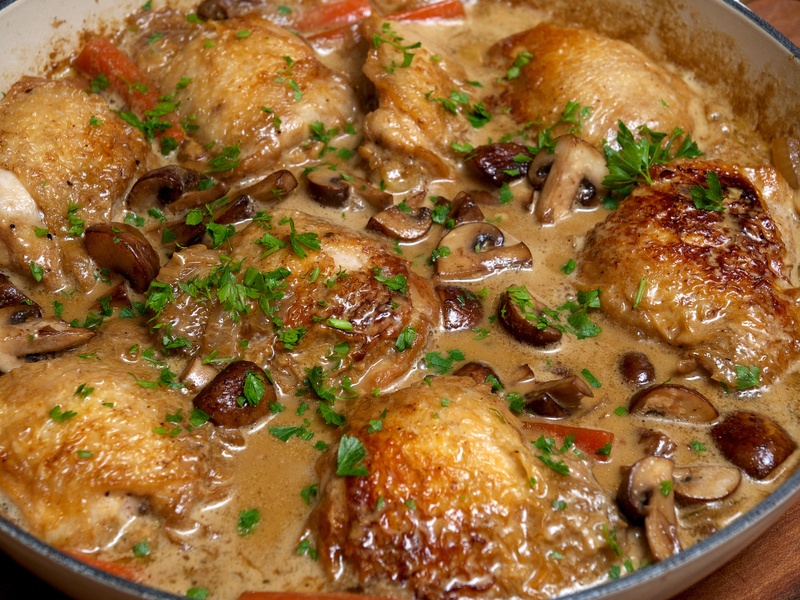 Wine Suggestion: Rich, creamy and earthy … we picked a German Pinot Noir, the Salwey Reserve “RS”Spätburgunder 2012 which balanced perfectly with the chicken, complimented the mushrooms and had enough freshness and earthy spice for the creamy madeira sauce. We’ve become converts to German wines over the past decade and think that the best, like Salwey from Baden, provide a great alternative to Burgundian Pinot and would recommend giving them a try. Put the dried mushrooms in a bowl and pour over 50ml of boiling water, leave to soak for 20 minutes. Meanwhile, season the chicken thighs and heat the oil in a large sauté pan. Brown the chicken thighs well on both sides (don’t be tempted to turn them early or the skin will tear). When the chicken is well-browned remove it from the pan and set aside. Pour off all but 1tbsp of the chicken fat from the pan into a bowl but don’t throw it away. Heat the fat left in the pan and sauté the onions until soft and golden. Deglaze the pan with the Madeira. Add the carrots and the stock, plus the wild mushroom and their soaking liquid. Bring to the boil, then reduce the heat to a simmer, cover and cook for 10 minutes. Return the chicken to the pan, along with any juices, and keep it skin-side up. Cover and cook gently for 20 minutes. Remove the lid, stir in the cream, return to a simmer again and cook for an additional 10 minutes with the lid off. In a separate pan, heat 1 tbsp of the reserved chicken fat and sauté the mushrooms until golden brown and the liquid has evaporated. Season the mushrooms and stir into the chicken. The sauce should coat the back of a spoon at this point. Scatter over the parsley and serve with potatoes and green veg. This looks like Total Awesome! I don’t know where to begin, but I want to dine on this NOW! Yum. Thank you very much. Tried this dish this evening. It was scrumptious.